Biophysics is a field that applies knowledge of physics to understand and explain biological phenomena. Biophysicists study life at different levels, from atoms and molecules to cells, organisms, and their environments. They focus on questions such as how proteins function, how nerve cells communicate, how viruses invade human cells, how plants absorb sunlight and convert it into food, and so on. Biophysics has contributed significantly to improving human health in multiple ways—for example, through the invention of sophisticated equipment such as nuclear magnetic resonance (NMR) and magnetic resonance imaging (MRI), and by exploring the molecular basis of complicated biomedical diseases and developing methods to treat these diseases. 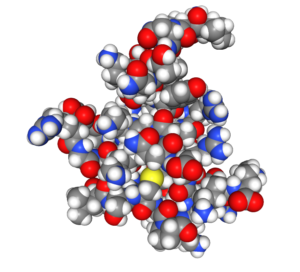 Protein-protein binding is a very important biophysical topic. Since many proteins are enzymes that catalyze chemical reactions in a cell, interactions between proteins can influence a cell’s metabolism. Antigens and antibodies are also proteins, and the way they interact plays a critical role in an organism’s immune response (Fig. 1). In our lab at Tennessee Tech University, we study a human protein called human beta defensin type 3, or hBD-3 for short (Fig. 2). hBD-3 is an important component of our immune system’s first-line defenses against invading cells. It has antibacterial, antifungal, and antiviral activity, disrupting bacteria or virus cell membranes, causing cell leakage, and even killing the cell. hBD-3 can also influence how cells divide and proliferate, which is important for controlling the spread of an infection in the body. The hBD-3 protein also exhibits an interesting property called chemotaxis, which means its movement changes in response to certain chemical stimuli. When hBD-3 binds with receptor proteins in the membranes of invading cells (shown in Fig. 3 and in the animation below), it can influence the invading cell’s movement as well. By studying the structure and behavior of the hBD-3 protein during this process, we can better understand the underlying mechanism and factors influencing how this protein functions in our immune system. In the videos below, watch a simulation of protein-protein binding, and check out A Capella Science’s musical biophysics primer, “The Molecular Shape of You”! Fig. 1 (Click to enlarge) Antibodies are a type of protein that play a crucial role in the immune system. 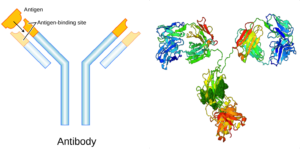 The image on the left (Wikimedia Commons) shows a schematic of an antibody and how its shape allows it to bind to a specific protein called an antigen. 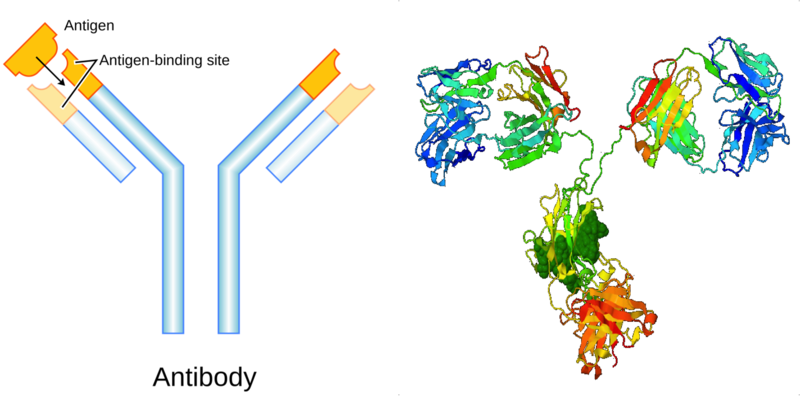 The image on the right (Protein Data Bank) shows the molecular structure of an antibody in more detail. By investigating a protein's structure, biophysicists can better understand how it functions in an organism. Fig. 2 (Click to enlarge) The structure of the hBD-3 protein (Protein Data Bank). Fig. 3 (Click to enlarge) hBD-3 is the small protein shown in red approaching a bigger protein (shown in blue), which is embedded in the lipid bilayer of a cell membrane (shown in green).